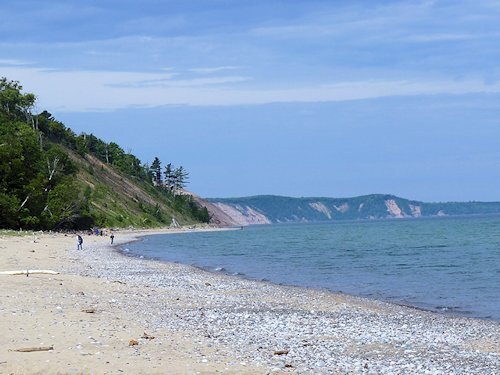 The village of Grand Marais, Michigan anchors the east end of Pictured Rocks National Lakeshore Park. 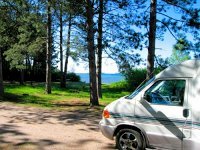 Its Woodland Park campground is a popular destination for RV owners who want to do some hiking and exploration in the eastern end of the park. The campground's beach also happens to be one the most popular beaches for rock picking and agate hunting - as the figures in the above pictures were doing. Pictured Rocks National Park offers some of the midwest's finest hiking, picturesque camping and picnicing on the shores of Lake Superior, beautiful waterfalls, and other scenic attractions including its namesake "pictured rocks." The park can be accessed from either Munising or Grand Marais, Michigan. Both entrances offer park visitor centers to assist you in exploring the park. < < < Sable Falls is at the eastern (Grand Marais) edge of Pictured Rocks National Lakeshore park. 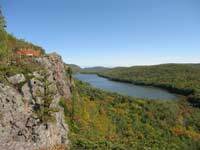 It is a short .6 mile hike that ends in a flight of stairs that descends into the gorge formed by Sable Creek. Ross and Jo on the other side of the camera for a change. On the way to the falls, stop at the Grand Sable Visitor Center for maps and information. < < < A relatively short, handicapped accessible trail leads to the Log Slide Overlook. Both this trail and the one to the falls are among the few in the park that allow dogs. Looking west towards the Au Sable Lighthouse. Au Sable Lighthouse Hiking Trail. The Au Sable Lighthouse can be reached by a 3 mile round trip hike along a woods road from the Hurricane River campground. The light keepers residence housed two families, the head keeper and the assistant. Lighthouse Tours are offered during the summer months. Click Here to learn more about the tours and the Au Sable Light Station here. More Hiking Trails - There are a few more day hiking and walking trails at the Grand Marais end of the park. Older maps indicate the road (County H58) is an unimproved sand road west of Hurricane River campground, but recently the road has been paved all the way to Munising. Some of these trails also allow pets - if on a 6 foot leash. 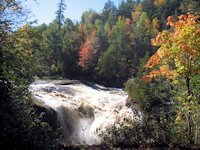 For ambitious day hikers without pets and overnight backpackers, the Lakeshore-North Country runs the entire length of the park and provides some great hiking with spectacular vistas. Several trailhead spurs intersect with the Lakeshore trail allowing longer day trips. Camping and Campgrounds - 3 drive-in campgrounds exist within the park providing water, tables, grills and toilets. There are no showers nor electric hookups so RV campers will have to dry camp. Also know that the access is via unpaved sand roads. Just south of the park are several more campgrounds located in Lake Superior State Forest, but are also limited in terms of services like electricity and showers. 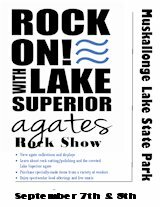 In addition there are 13 backcountry campsites sprinkled along the Lakeshore Trail and 7 group sites. These are very rustic - wilderness style camp sites: no potable water and only a few have toilets. Camping is allowed only at designated sites and pets are not allowed on backcountry trails or in backcountry campgrounds. See our Pictured Rocks Boat Cruise.